Your organization likely has a long-term strategy…but strategic directions shift over time or you may not be able to align existing resources around that strategy. 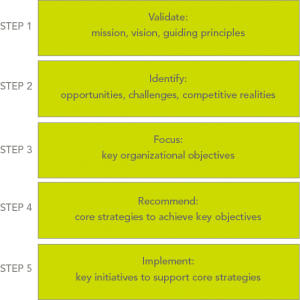 Working with organizations at all stages of business - from start up, through growth and into maturity - we bring a practical 5 step approach to working with key client stakeholders to develop relevant, actionable and measurable strategic plans to deliver the most impactful outcomes. Through strategic planning, we help growing organizations confidently achieve desired shifts in directional strategy – transforming their strategic ideas into practical and effective realities. Here are some examples of the services we provide. Truly effective leaders are not born, they develop over time. And in the fast pace of today, every leader has the responsibility, and the potential, to build on the critical skills required for success. 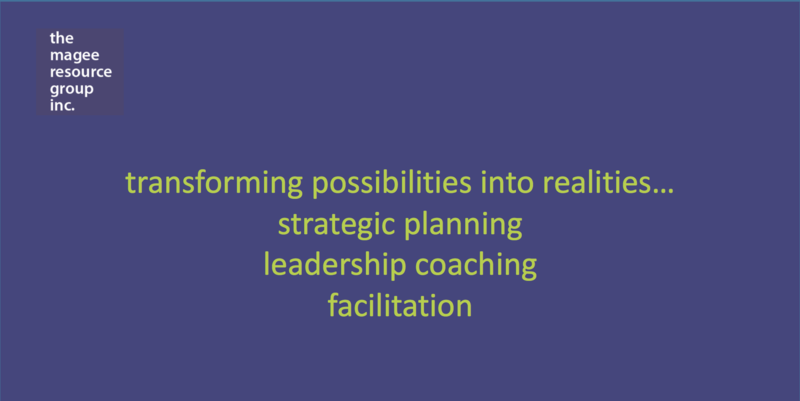 Using a practical strength-based approach, I partner with every client to provide a customized plan to suit your unique needs; with tools and frameworks that are relevant to develop the necessary skills and techniques to further enhance your leadership capabilities. Regardless of where you are in the leadership journey, if you are interested in building your skills with coaching, I can help. Our goal is to help our clients feel understood, engaged and confident in achieving their business and professional development growth objectives, while benefiting from the guidance and insights we bring to the experience. We believe in focusing on strengths and possibilities to reach tangible outcomes. We love working with clients across a broad spectrum, not just in terms of B2B and B2C but also corporate, social ventures, and non-profit. We are able to leverage learnings and insights from each sector over to clients in other sectors, so everyone benefits. Katherine Magee (MBA, RCC) is the principal of The Magee Resource Group Inc., founded in 2006 to help organizations and leaders achieve success in translating their business and professional development objectives into tangible realities. Katherine's expertise is in strategic planning, leadership coaching and facilitation. Katherine brings over 25 years of strategic business thinking to working with clients in multiple sectors. From start-ups to some of Canada's largest corporations, Katherine has led strategic planning initiatives that enable the success of these organizations. She also launched a web-based business in 2007 which was then sold to a large US public company. In her corporate life, Katherine was Vice-President, Marketing at Franklin Templeton Investments where she was responsible for developing and implementing national strategies for marketing and corporate branding, and leading cross-functional working groups for new product and program development, and Director of Corporate Affairs for Koala Beverages Limited, a publicly-held company in Vancouver. Since 2010, Katherine has also been a part-time lecturer in the Strategy area at Rotman (University of Toronto); recognized with an Excellence in Teaching Award in 2011, 2013, 2015, 2016 and 2017. She is also on the boards of Trade+Impact Association and the Canadian African Business Women’s Alliance, and the Advisory Board of Impact Consulting (affiliated with Rotman School of Management). Copyright 2016 - Magee Resource Group Inc.